Skip sizes are measured in cubic yards which, let’s face it, this doesn’t mean a lot to most people, so deciding which skip size to go for can be tough. Here, you can browse each of our skip sizes, each of which has plenty of info on its merits and drawbacks so that you can make the right decision for you project. As a general rule, the bigger the skip, the better the value, but that’s not to say that every clearout will require a 12-yard skip. On the one hand, you could end up spending money on space that you haven’t filed; we don’t want you to pay for space that you don’t need. 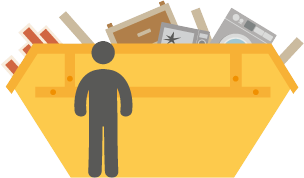 On the other hand, it’s worth remembering that hiring too small a skip and ending up having to order another one is going to put your overall skip hire price up considerably. Luckily, our friendly phone staff have the know-how to guide you through any split decision that you might find yourself in, so there’s no need to worry about making the right decision without any help. We’ve got you covered. Here you’ll find that we’ve laid out the various skip sizes on offer, along with all the necessary diameters and measurements to give you a rough idea of how much waste each skip can hold. 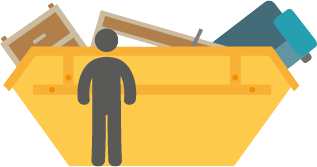 For more information on which skip size is best for your particular needs, it’s also well worth checking out our ‘project types’ page. Its better to order a big skip and not quite fill it than to order a small skip and end up having leftover waste. Legally, a skip can be filled right to the top, but waste cannot be piled higher than the sides of the skip. If you are filling your skip with heavy waste such as builders rubble, soil or concrete an 8-yard skip is as big as you can go, otherwise the skip lorry will be unable to take the weight. Whichever skip size you opt for, it will be delivered to you and collected by a skip lorry, so remember to factor this in when deciding where you’re going to place it. And remember, if you can’t find what you’re looking for or need any more information on skip sizes, feel free to give us a call, we’re always happy to help! For smaller quantities of waste, a 1-yard skip bag could be just what the doctor ordered. Skip bags are tough, durable, lightweight plastic bags that serve as a great alternative to traditional skip hire. They’ll hold about the same as 10 fully filled black bin liners and arrive flat packed, making them easy to store before use. The smallest conventional skip available for hire. The 2 yard skip — or ‘mini skip’, as it’s often referred to — is perfect for small scale clean up jobs or small amounts of garden waste. It will hold roughly 20-25 fully filled black bin liners. The most commonly hired skip for domestic use. The 6 yard skip, or ‘Builders skip’, is great for kitchen refits, bedroom refits or a large house clearance. It will hold around 50-60 full black bin liners or, if you’re getting rid of some bulky waste, three two-seater sofas might be a more useful example. The 8-yard skip is the most widely used skip in the U.K. If you’re refitting more than one room, or having a major garden overhaul, then the 8-yard skip is perfect skip for the job. This skip can hold the equivalent of between 60-80 full black bin liners; that’s enough to fit in three two-seater sofas with room for a couple of arm chairs, too! Whilst unsuitable for large quantities of heavy or dense waste, the 10-yard skip is perfect for getting rid of light but bulky building waste like breeze block, wood or plastics. With a capacity of up to 7.64 m³ — that’s the equivalent of about 80-100 black bin liners — this skip is ideal for anyone knocking down a small extension, for example, or refurbishing several rooms throughout the house.